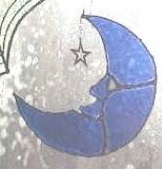 Man in the Moon design, shown in clear blue with star detail. 7in. 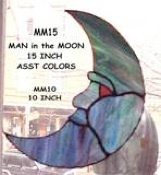 Man in the Moon design, with rays of the sun, in black and white glass. Sun and Moon Chalices here on cobalt glass, contact us for available glassware. Half Moon Sun Catchers, 5 in. or 3 in., here shown in light blue and orange striated glass. Man in the Moon design, shown in assorted colors. This guy is larger he’s 15in. tall.